Above is a sign for a jewelry company/store. This sign is made from HDU which has been lightly sandblasted to achieve a sandstone texture. 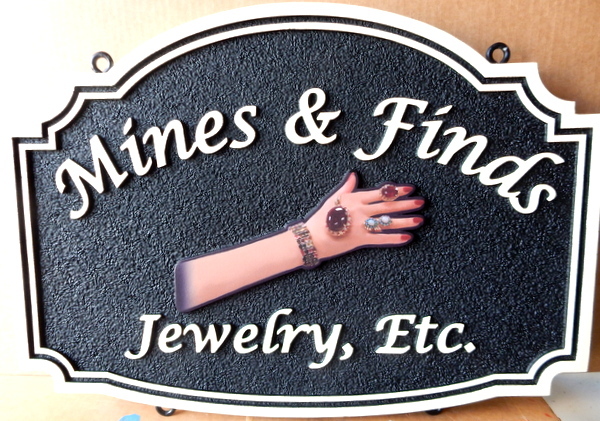 The sign features a 3-D carving of a woman's hand/arm showing 3-D carved rings, necklace and bracelet. The lettering and double borders are carved in 2.5D raised (flat relief). Finally, the sign is painted with long-lasting automotive-grade enamels and clear-coated twice, making it ready for either indoor or outdoor use.